What is Vibrant Health Joint Vibrance? We have had a look at the Vibrant Health Joint Vibrance and give you a detailed review of its strengths and weaknesses. This product claims to offer a unique and reliable way to remedy joint pain such as arthritis as it mixes in a special ingredient into an already tried and tested formula. If you wish to learn more about this particular product you can check our full review below. Other ingredients include natural orange pineapple flavor, citric acid powder, yacon root powder, stevia leaf extract, sunflower lecithin powder. This supplement comes in the form of a powder that you mix with water or beverage of your choice. The recommended dosage is 1 scoop mixed with 4 to 8-ounces of liquid. Mix well and drink between meals. It is not stated how many time a day you should have this supplement. This supplement is also available in tablet form. One bottle of Vibrant Health Joint Vibrance powder is available for $49.95. We checked around their official website and found no discounts available at the moment. This product is available via their official website as well as through well-known online stores. You can try their sample package first if you wish which is priced at $1.00 and will include 5 grams of this product in powder form. We found no cases of side effects when using this product. There is a long list of ingredients in this supplement which increases the risk for side effects, however, the ingredients are natural so side effects should be minimal. Those who are pregnant, nursing, or taking medication should consult their doctor before using this supplement. The official website does mention a 100% consumer guarantee and they state that you can return a product within 90 days of purchase. However, you can only return products that are unopened and are returned in their original packaging. 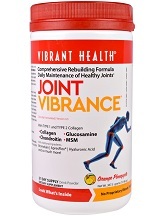 Overall, Vibrant Health Joint Vibrance seems to be a unique and specially made joint support supplement. It contains a range of ingredients that are fast acting and offer round the clock relief from arthritis. It also comes in any easy to use drink formula. The money-back guarantee is pretty decent, however, as you can only return unopened bottles, it doesn’t leave you much option to try the product. There are also no reviews on the manufacturer’s website to help determine the effectiveness of the product.